Joel! Leafing through your 1998 [Folk Music] Resource Directory I am filled with admiration for you & gang. Congrats....Other cities can learn from you. Thanks! I'm working on a documentary about the circumferential highway being planned here in Vermont (which I'm very much against—sprawl, environmental degradation, cost, alternative transportation issues, etc.)... Just wanted to drop you a line to let you know that whatever else you achieved today, you inspired me. Joel, I just wanted to tell you that your article on mural maintenance was extremely helpful. Thank you so much for posting it on the web!! I've told at least ten people about the wiggle, and passed on your article to several of them. (it was excellent, I thought.) Also I put your piece about gay marriage up on my blog. It was such a nice and well-written piece that I thought others would enjoy reading it (and they did)! I especially liked your story "Hardly Like There's An Audience." I think you portrayed this homeless guy realistically. I empathized with him in his frustration in not remembering how long he had been on the streets, etc. The language you used to portray how he spoke was very real. I could "feel" his anxiety. It is a good story and I enjoyed reading it. Thanks. You are my hero! Thanks so much for the great info about the graffiti issue. A fantastic article! The [Critical Mass] glossary is grrrrrrrrrrreat. 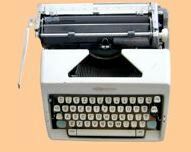 i just bookmarked your page for later! As result of the article “San Francisco's Clean Little Secret” on San Francisco water, three members of the San Francisco Board of Supervisors (Matt Gonzalez, Ross Mirkarimi and Aaron Peskin) encouraged my participation in policy planning. In the words of 2005 Board President Aaron Peskin: "Very interesting [research]...I really suggest that you work with the Public Utilities Commission. I know that the PUC has recently become much more interested in ground water within the City." As a result of the article “Do the Wiggle” on bicyle routes in San Francisco, neighbors and cyclists started an ongoing, multi-year campaign to redesign neighborhood streets, beginning with the Lower Haight area. 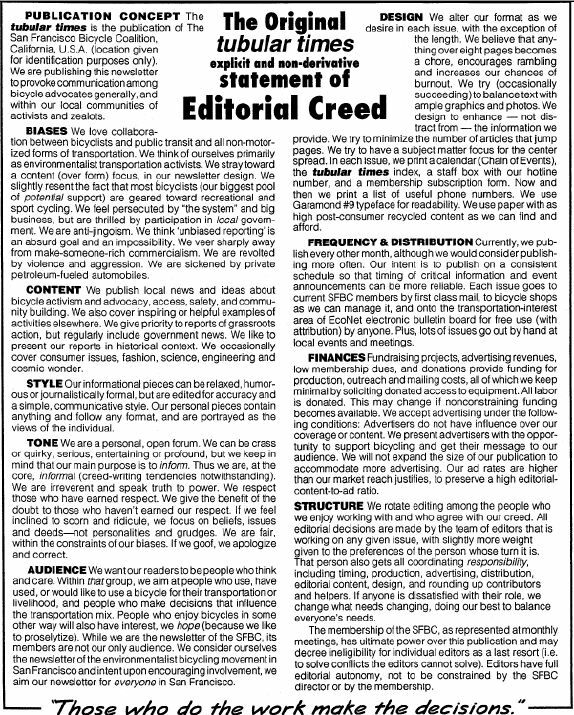 The “Editorial Creed” set the standards which influenced and guided editorial policy and membership focus for nearly a decade at the influential advocacy group, the San Francisco Bicycle Coalition. A 1998 open letter to reinvigorate this vision spawned an international festival of bicycling (Bike Summer) which has since been held each year in a new city.